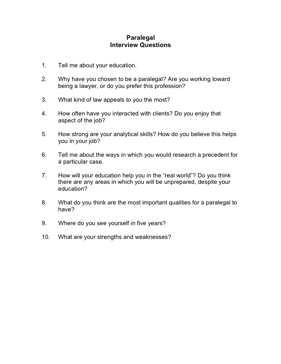 Choose your next Paralegal with the aid of these helpful interview questions. 1. Tell me about your education. 2. Why have you chosen to be a paralegal? Are you working toward being a lawyer, or do you prefer this profession? 3. What kind of law appeals to you the most? 4. How often have you interacted with clients? Do you enjoy that aspect of the job? 5. How strong are your analytical skills? How do you believe this helps you in your job? 6. Tell me about the ways in which you would research a precedent for a particular case. 7. How will your education help you in the "real world"? Do you think there are any areas in which you will be unprepared, despite your education? 8. What do you think are the most important qualities for a paralegal to have?